Bruce Roberts-Goodson Marine designed 45�WaveRunner, LOA 49.5, 15�3� Beam, Swim Platform, Twin 3116 Cats, 300 HP, Turbo, 12Knots at 2200 RPM, max 16Knots at 2600 RPM. Vented Engine Room w/Halon Protection, 8KW Onan Generator, 2000 and 8000 Gal Auto Bilge Pumps. Queen Stateroom forward w/ Manual Head & Hanging Locker. Second Stateroom Starboard opposite Main Head Portside w/SS Shower. Galley w/Norcold Refrigerator/Freezer (2004), 4 Burner Propane Stove w/Oven, Double SS Sink, Microwave. Arctic Diesel Heat, 18Gal Hot Water Tank, 30/50 Amp Shore Power. Raytheon R-20 Radar, 2 VHF, 2 Depthsounders, Wagner Autopilot, Interphase Loran, Sitex GPS, Electroguard System, Dripless Packings. 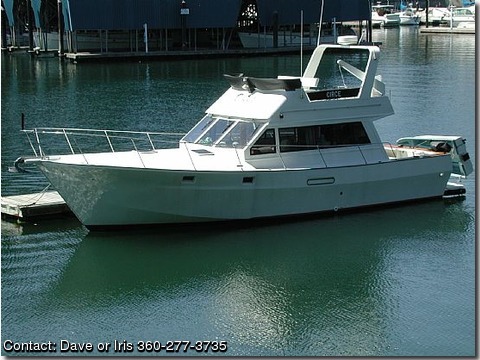 Davit, Transom Door, Maxwell 2200 Windlass, 719 Gal Fuel, 220 Gal Water, 100 Gal Holding Tank with Y Valve, Builder Western Sheetmetal & Marine.